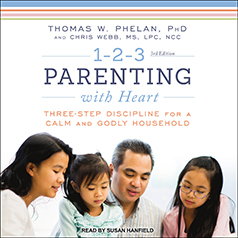 In 1-2-3 Parenting with Heart, Dr. Thomas W. Phelan and pastor Chris Webb teach Christian parents to take charge while refraining from yelling, leading to better behaved children, happier parents, and a more peaceful home environment. ● Controlling Obnoxious Behavior: Learn an amazingly simple technique to get the kids to STOP doing what you don't want them to do (whining, arguing, tantrums, sibling rivalry, etc.). ● Encouraging Good Behavior: Learn several effective methods to get your kids to START doing what you want them to do (picking up, eating, going to bed—and staying there!, chores, etc.). ● Strengthening Your Relationships: Learn powerful techniques that reinforce the bond between you and your children.